Sabona Copper Bracelets are made with the purest copper available – 99.99% pure! All styles are crafted using techniques that create a very comfortable and durable bracelet for you to enjoy. They are manufactured to maintain the shape and quality appearance. 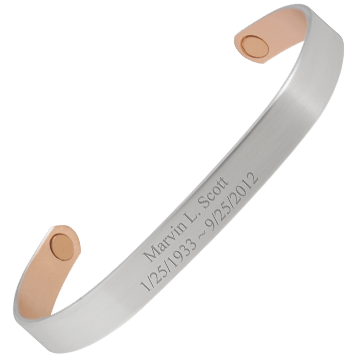 The wristbands or cuff styles have a 1700 gauss rust-proof samarium cobalt magnet in each tip. Especially stylish are the silver and gold plated Sabona Copper Wristbands. The plating is on the outside only, so the copper is still in direct contact with the skin. 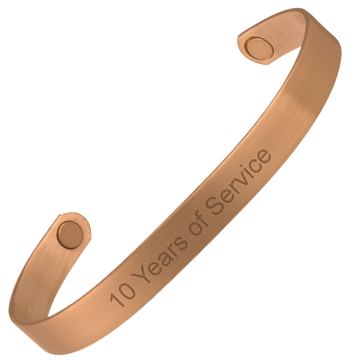 We can help you create your own unique Sabona Copper Bracelet by engraving your custom message on the top of the bracelet. Contact information, your name or that of a family member, an inspirational message, or a memorial to a loved one who has passed, are all great ideas for your customized Sabona Copper Bracelet.